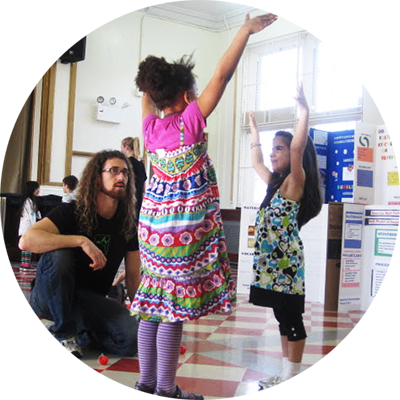 Wingspan Arts provides custom in-school arts residencies designed to meet the needs of participating K-12 schools. With a variety of designed programs, Wingspan’s current in-school residencies range from providing elective arts classes to integrated arts programming. All of Wingspan in-school residencies grow from a creative, collaborative process between Wingspan Arts and the School Partner, based on the disciplines listed below. During the planning stages, we thoughtfully work with school administrators to design each program for its corresponding grade level based on state and national standards, in addition to specific arts standards such as those outlined in The New York City Blueprint for the Arts. The same collaborative spirit continues when our Teaching Artists enter the learning environment to work with staff and students. Wingspan Teaching Artists, in collaboration with classroom teachers, work with students in a variety of creative disciplines during their academic day. Our hope is that as we collaborate with a school, we become a true arts partner and an enduring member of that school’s community. Our theatre classes combine storytelling and imagination to instill among students a deeper understanding of drama and performance. Students learn the basics of acting, scene study, character creation, playwriting and performance as they listen to classic and contemporary children’s stories, create their own characters and perform for their peers. Through our music curriculum, students become active engaged musicians, experiencing music through songs, games, exercises and by listening. Each student walks away understanding music as a language, with an ability to express themselves using musical vocabulary. Through vocal and percussion performance, musicians explore fundamentals of dynamics, tempo, pitch, melody, harmony, beat and rhythm. Teaching Artists work with students in performance ensembles or individually, paying close attention to pitch, vocal technique and diction. The dance program introduces elements of rhythm, beat and telling a story with the body. Through a series of games and movement exercises, students learn such styles as ballroom, African, Jazz, Salsa, Afro-Caribbean, Hip Hop Step and Swing. Students also have the opportunity to experience both teacher technique and student-created choreography. The visual arts program gives students the opportunity to work with professional-grade materials in a creative and interactive environment. Students learn drawing, painting, sculpture, recycled arts and much more from professional artist-educators who teach the context of a particular era, then guide students in designing and creating their own independent works. Contact us to request more information about bringing an In-School Residency to your school or organization. We enjoy working with Wingspan because of the enthusiasm and creativity they bring to our programs. We have witnessed students blossom into stars when given the chance to show their artistic talents. This success and recognition trickles over into their schoolwork and their academic performance usually improves. ©2018 Wingspan Arts, inc. All Rights Reserved.